Home » Giant » purchase » spend » travel contest » Beli DASHING Dan Menang Contest: Win a Manchester trip! 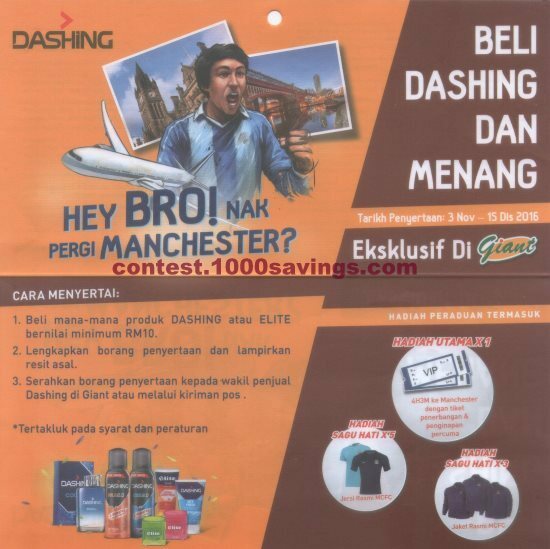 Beli DASHING Dan Menang Contest: Win a Manchester trip! Grand Prize: 4D3N Manchester trip inclusive of flight ticket and accomodation. Buy a minimum of RM10 worth of any DASHING or ELITE product at any Giant outlet. Complete the Contest Form and attach the original purchase receipt. Submit your completed Contest Form to any DASHING promoter at Giant or via postage to the address in the contest form.